While I was taking photos of a family of baby owls growing up, I heard a lot about wildlife. I want to share with others the kind of information that gets transferred sometimes. In one instance I mentioned to an observer that there were three baby owls. This observer, a woman, looked at me and said, “No, there is only one”. I tried pointing out that you could see at least two of them at any one time. This woman continued: “No, that is impossible since mother owls sacrifice all but one — only one is ever raised”. This was said with such a very commanding and definite voice, that I decided just to listen. I asked her how she might know this. Her response was that everyone knows this, it is written in books. I actually didn’t know how to handle this situation, except to just let it go. But I have discovered that this is actually not unusual on several fronts. Humans often see very little of the wildlife around themselves. We often would prefer reading or hearing about something than actually making observations ourselves. I would say that 30% of walkers do not see the coyotes that are right out in the open on a hill, or on the path right in front of them. When you point it out, they are amazed that there are coyotes in a park in a big city. To a certain extent this actually reminds me of myself. I didn’t realize there were so many children around until I had some myself, at which point I started “seeing” them and playgrounds all over the place! The same with dogs: not until I had my own dogs did I truly “see” the quantity and types of pets that people owned — and also the off-leash parks and dog-runs. And, not until I wanted to “collect” some different species of bird photos did I actually see that there were more than robins, hummingbirds and pigeons. And that is how it seems to go. Most people are not very aware of coyote behavior. The Internet dispenses some misconstrued information: speculations and theories that someone thinks maybe “could” hold. One observation seems to be grist for a generalized theory. This, added to the observed fact that coyotes are highly individualistic in their behavior — it is hard to generalize, just as with human behavior — their behavior is also very situation-oriented. People have told me that a coyote which loses its fear of humans will become aggressive — they have read this on the Internet. Since, by definition, urban coyotes are going to become habituated to humans, this would suggest that all urban coyotes will become aggressive. One needs to dig a little deeper, and look at sources. First of all very few coyotes or habituated coyotes ever become aggressive at all. Coyotes are not particularly aggressive animals, even though they will defend themselves from dogs — aggressive and defensive behavior have to be distinguished. More importantly, some have speculated that intentional feeding may be the most significant reason if and why some coyotes begin to exhibit aggression toward humans. How important is intentional feeding, as the root cause of coyote aggression toward humans? Chicago has not had aggressive coyotes, even though there are 2000 of them in the city, accustomed to humans and their activity. In southern California there have been aggressive coyotes — I have read that all the incidents there can be traced to feedings. The question of human and coyote coexistence and habituation is an important one. Acceptable habituation should not mean that a coyote will feel comfortable wandering casually into areas where there is high human activity — such as a picnic — it should mean coyotes will feel okay seeing humans in the area. When coyotes engage in activity which we don’t fully comprehend, it is best to create a distance. I heard of an instance when a coyote approached the peripheral area of a day-camp and started barking. It is unlikely that it did so because it was habituated and felt comfortable doing so. Might its approach and distressed barking have been set off by the loud noise and high activity level of the campers? I know sirens have been known to cause coyote barking sessions. The coyote, which remained across the creek and never really entered the camp area, took off when the camp director approached with small stones which he tossed not at, but around the coyote. It is always best to keep your distance from wildlife, especially when you don’t understand what their activity is suggesting: Wildlife follows its own rules, and these rules are not the same as our own, nor are they always understandable to us. I would challenge everyone who can to actually observe coyote behavior: there is a rich family life, hunting, curiosity, lots of intelligence, community. The ones I’ve observed are totally peaceful unless they are interfered with. Pupping season offers more territorial challenges, but we can respect that. Please also notice that they might display the same behavior that was dished out to them: if you aggressively throw stones at a coyote, then if he becomes cornered, might he feel he has to bite his way out of the corner, rather than be allowed to pass? 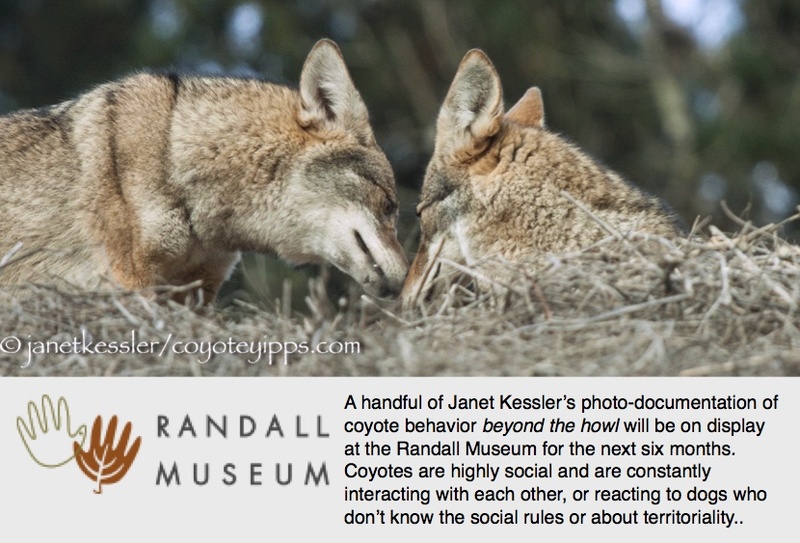 Please note that these are a coyote’s defensive behaviors. If you understand them, you will better be able to deal with them. Please keep your dogs leashed in a coyote area and please read about coyote safety which I have posted at the top of this blog.